Although holidays like Christmas, Hanukkah and Kwanzaa aren’t celebrated all around the world, nearly every nation comes together to celebrate the New Year on the night of December 31st. To kick off this global celebration, we put together a list of some of the best street foods from around the world. No matter where you are this time of year you can still eat a local favorite and get it at a great price. We’ll skip the traditional New York hot dogs and Chicago deep dish pizzas and go for some of the most iconic international street foods. Berlin is an amazing destination for street food, with its legendary Currywurst and some of the best Doner Kebab outside of Turkey. Currywurst is essentially fried pork sausage which is sliced and covered with delicious curry ketchup, often served with French fries or bread rolls. Doner Kebab is very popular throughout many European countries, and is similar to the gyros we eat in the United States. However these kebabs usually consist of plenty of sliced meat from a vertical spit, filled with a unique assortment of fillings like lettuce, tomato onion and cabbage, and slathered in white sauce and hot sauce on a warm flatbread. Known as a quick source of sustenance for cash-strapped college students, ramen is traditionally eaten in Japan and served with toppings like pork, seafood, green onions and seaweed. The concept of thin noodles served in a meat flavored broth is still the same, just taken to a more gourmet level. Takoyaki are a more unique offering from Japan, known colloquially as octopus balls. These battered wheat flour balls are stuffed with octopus, tempura and green onion and cooked in a special pan to shape them into a golf-ball shape. 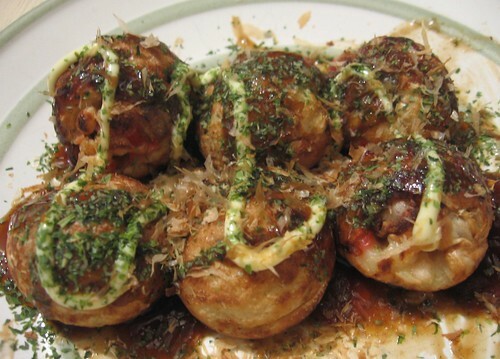 The takoyaki are then topped with a delicious okonomi sauce and served in stalls throughout Osaka, Japan. Now making a huge splash in the United States, Vietnam’s Banh Mi has become one of the most widespread and beloved street foods from the continent of Asia. This peculiar sandwich dates back to the French colonial period when Parisian ham and baguette sandwiches made their way to the country. Now Banh Mi is typically filled with pork belly or a similar home-cured meat, cilantro, pickled cucumber, carrot, daikon, chiles and mayonnaise in a similar French-style baguette. The word ‘gelato’ carries a certain weight to it, but most American varieties are just imitations of this traditional Italian frozen dessert. Meaning “frozen” in Italian, gelato was first presented to the royal court of Caterina dei Medici in 16th-century Italy. Gelato differs from ice cream in that it is made from milk instead of cream, giving it a lower fat content and is whipped with less air into than ice cream, giving it a more intense flavor. Another street food that has caught on in the United States, crepes come in all shapes and sizes and are often considered a gourmet addition to breakfast or brunch. Crepes are essentially thin pancakes made from a wheat batter. Chefs spread the batter very thinly over a large round grill, and use a special tool called a rozell to spread the batter in a circular motion while it cooks. Crepes can be sweet or savory and are often topped with and filled with an assortment of ingredients before folded into a triangular shape for consumption. Pomme frites are a huge upgrade from the soggy fast-food French fries many of us are used to eating alongside a burger and soda. Pomme frites are a meal all by themselves, and a signature street food in Brussels. The frites are always freshly fried, crispy on the outside and soft and chewy on the inside, served piping hot in a paper cone. The frites are always accompanied with a signature sauce, going far beyond the standard ketchup and barbecue sauce options. Some stores have up to 25 types of sauces, making pomme frites the perfect street food on-the-go in Belgium. No street food tour of the world would be complete without a trip to South America. With so many options to choose from including tamales and pupusas, the ubiquitous empanada just might be the most beloved. Empanadas are flaky, handheld pastries that are stuffed with a combination of meat cheese and vegetables and finally baked or fried. Served golden brown and piping hot, empanadas have caught on like fire in the United States.